The title track starts the album and, as I mentioned, it is an ELP-ish instrumental. Then there's "Frutto Acerbo," another in a growing line of the band's catchy, acoustic vocal songs. 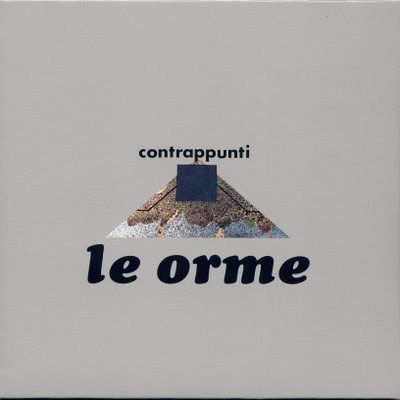 But the third track, "Aliante," is something that had not been heard from Le Orme before. Measured, deliberate, stabs of lower-register organ chords support a simple synthesizer theme, creating a mechanized atmosphere that brings to mind something that Brian Eno might do. "India" has a similar feel, even if it's in a different style — this time the foundation is a simple, repeated bass theme and the meat of the song is filled with synthesizer atmospheres and a mournful vocal melody. The unresolved nature of the bassline and the vocal melody give the song a precarious atmosphere that is unlike anything else the band had previously recorded. I love it. "La Fabbricante D'Angeli" gets things back to more common turf, it being a traditional sort of symphonic prog piece complete with the requisite drama and big melodic themes that state themselves in grand fashion. But it's better, I think, than the band's previous attempts at this sort of thing. Particularly, I'm struck by how tasteful it is — listening to it, I get the same effect as when I put on Locanda Della Fate's Forse le lucciole non si amano più: it is music that I would normally expect to descend into schmaltz, but somehow it stays potent and un-cheesey. Sequenced after "India," its attributes are maximized: it offers a resolution that "India" doesn't provide. "Notturno" is a slow, atmospheric instrumental featuring the piano and Moog synthesizer. It does a nice job of setting up the great "Maggio," the highlight of the album and the best extended Le Orme piece that I've heard. At the heart of "Maggio" is a sweeping keyboard theme characteristic of symphonic prog, but I like how this portion of the song is initially withheld — the opening three minutes project an uncertainty and the character of the music is more similar to "India" or "Aliante" than "La Fabbricante D'Angeli." Thus, once the rest of it kicks in, the effect is made all the more powerful.